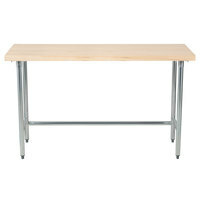 Outfit your bakery, cafe, deli, or restaurant with these wood top work tables. 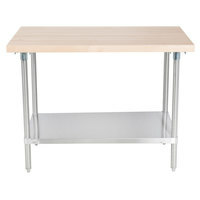 Their wooden surfaces can hold countertop equipment, and they can also serve as cutting boards! 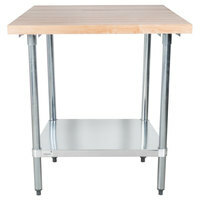 Use these wooden baker’s tables to knead dough, shape cookies, mix batters, and perform other baking tasks. 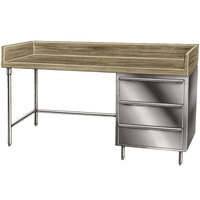 You’ll also appreciate that each wood top is laminated to prevent ingredients from getting trapped in small cracks. 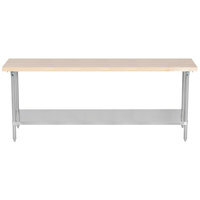 Our selection of wood top work tables includes options with open bases to accommodate ingredient bins, as well as units with undershelves for storing equipment and supplies. 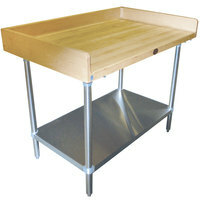 We also offer work tables with drawers that can be used to hold bulk amounts of flour, sugar, and other essential baking ingredients. 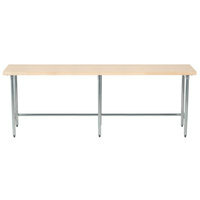 Choose from tables with dark or light finishes to maintain a consistent look with the other equipment in your kitchen. 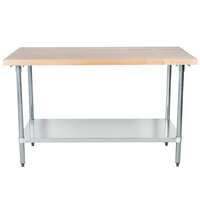 Advance Tabco H2G-305 Wood Top Work Table with Galvanized Base and Undershelf - 30" x 60"
Good - This wood top work table is a great option for your various kitchen prep, from carving meats and chopping fresh ingredients, to plating food. Its galvanized steel legs and undershelves offer the right amount of support. 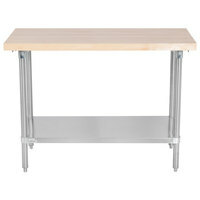 Better - This work table is a reliable and sturdy option for all your kitchen prep needs! 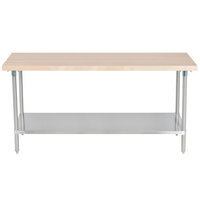 It has durable stainless steel legs and undershelves, which hold up well over time against rust and strain from frequent use. 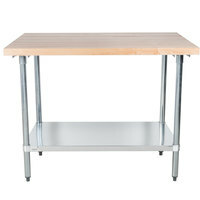 Advance Tabco H2G-308 Wood Top Work Table with Galvanized Base and Undershelf - 30" x 96"
Advance Tabco TH2G-306 Wood Top Work Table with Galvanized Base - 30" x 72"
Good - This wood top work table is a great option for your various kitchen prep, from carving meats and chopping fresh ingredients, to plating food. 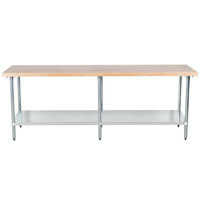 Its galvanized steel base offers the right amount of support. 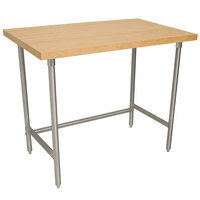 Advance Tabco TH2S-306 Wood Top Work Table with Stainless Steel Base - 30" x 72"
Better - This work table is a reliable and sturdy option for all your kitchen prep needs! 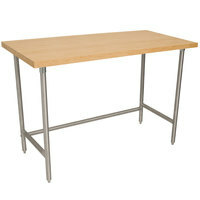 It has a durable stainless steel base, which hold up well over time against rust and strain from frequent use. 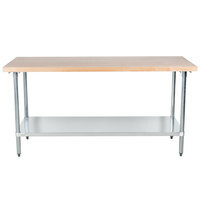 Advance Tabco TH2G-308 Wood Top Work Table with Galvanized Base - 30" x 96"
Advance Tabco TH2S-308 Wood Top Work Table with Stainless Steel Base - 30" x 96"
Advance Tabco H2G-306 Wood Top Work Table with Galvanized Base and Undershelf - 30" x 72"
Advance Tabco TH2G-307 Wood Top Work Table with Galvanized Base - 30" x 84"
Advance Tabco TH2S-307 Wood Top Work Table with Stainless Steel Base - 30" x 84"
Advance Tabco TH2G-305 Wood Top Work Table with Galvanized Base - 30" x 60"
Advance Tabco TH2S-305 Wood Top Work Table with Stainless Steel Base - 30" x 60"
Advance Tabco TH2G-304 Wood Top Work Table with Galvanized Base - 30" x 48"
Advance Tabco TH2S-304 Wood Top Work Table with Stainless Steel Base - 30" x 48"
Advance Tabco BG-304 Wood Top Baker's Table with Galvanized Undershelf - 30" x 48"
Good - This wood top baker's table is a great option for your various kitchen prep, from carving meats and chopping fresh ingredients, to plating food. 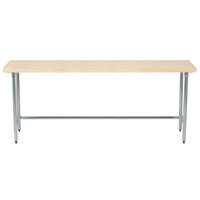 Its galvanized steel legs offer the right amount of support. 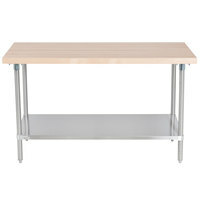 Advance Tabco BS-304 Wood Top Baker's Table with Stainless Steel Undershelf - 30" x 48"
Better - This baker's table is a reliable and sturdy option for all your kitchen prep needs! 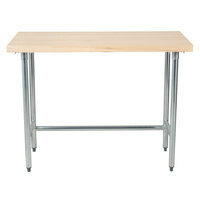 It has durable stainless steel legs, which hold up well over time against rust and strain from frequent use. 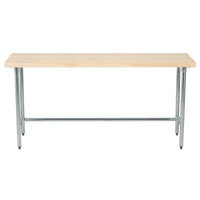 Advance Tabco BG-305 Wood Top Baker's Table with Galvanized Undershelf - 30" x 60"
Advance Tabco BS-305 Wood Top Baker's Table with Stainless Steel Undershelf - 30" x 60"
Advance Tabco BG-306 Wood Top Baker's Table with Galvanized Undershelf - 30" x 72"
Advance Tabco BS-306 Wood Top Baker's Table with Stainless Steel Undershelf - 30" x 72"
Advance Tabco BG-307 Wood Top Baker's Table with Galvanized Undershelf - 30" x 84"
Advance Tabco BS-307 Wood Top Baker's Table with Stainless Steel Undershelf - 30" x 84"
Advance Tabco BG-308 Wood Top Baker's Table with Galvanized Undershelf - 30" x 96"
Advance Tabco BS-308 Wood Top Baker's Table with Stainless Steel Undershelf - 30" x 96"